Did you know there’s a whole other Spider-Man series that takes place in a multiverse where each universe has its own version of Spider-Man? I’ll admit I was not aware of this arachnid-humanoid-related development, but I am now. There’s a new movie coming out about one of these Spider-verses, and, for our purposes, the most important thing you need to know about that parallel universe is that Yugos are still being made. What a glorious universe. See that billboard? 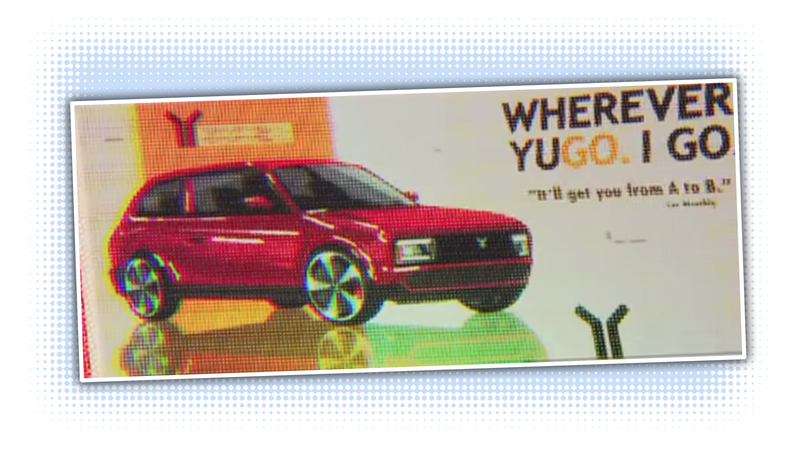 It’s advertising an all-new Yugo! I believe this alternate universe takes place in the same year as ours, so that’s a 2018 Yugo there. In our universe, Yugos were built by Zastava in what was Yugoslavia, and even survived the bombing of the factory in 1999, with the cars being built and sold as the Zastava Koral up until 2008. They haven’t been sold in America since 1992 in our universe, but clearly, that’s not the case here. The Yugo appears to have kept their logo basically the same as the one we knew in our universe, but they do have more playful taglines, which seem to include “Wherever YUGO, I go,” and they’re using a powerful and evocative quote “It’ll get you from A to B,” which I do hope comes from a story on that universe’s version of Jalopnik. The design of the 2018 Yugo appears to be a pretty direct evolution from the boxy little hatch we knew; it’s much more aerodynamic looking, with bolder, more agressive wheels and a lower, wider stance. The front end keeps the original’s rectilinear simplicity, and the old black plastic bumper is referenced with a wide lower air intake. I like it! Also important is the question of does this mean that in this alternate universe, Yugoslavia still exists as a country? Woah. We’ve reached out to Sony for comment, and will report back any important alternate-universe Yugo-related information they give us.